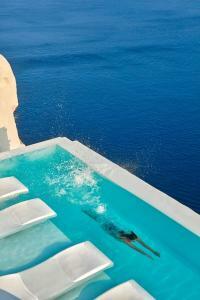 Canaves Oia Suites & Spa is located in Oia, on a cliff overlooking the Caldera. It offers private parking and a gourmet restaurant. 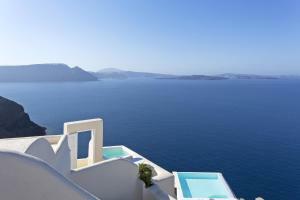 In addition, it has a private yacht for cruises on the islands of the Aegean Sea. 1 extra bed can be added. You can add 1 extra bed in this type of room. There is a sofa bed in the living room. This suite includes a 1 bedroom with a king-size bed, a separate living room, a spacious bathroom with a rain shower, a walk-in closet and a private veranda with an outdoor infinity pool overlooking the volcano and the Aegean Sea. Its 3 double bedrooms house a private bathroom with shower. It also offers air conditioning, LCD TV, bathrobes and VIP toiletries. In addition, there is a spacious living room with an LCD TV, a fully equipped kitchen and a large veranda with a hot tub. This elegantly furnished suite features a private terrace with plunge pool, hydromassage jets and views of the crater, volcano and Aegean Sea. It consists of 1 independent bedroom, living room and bathroom with rain shower. This spacious suite is elegantly furnished and has a private terrace with a plunge pool, hydromassage jets and panoramic views of the crater, the volcano and the Aegean Sea. It consists of 1 independent bedroom, living room and bathroom with rain shower and bathtub. It also includes a dressing room and outdoor dining area. This suite has a balcony, a seating area and a flat-screen TV.